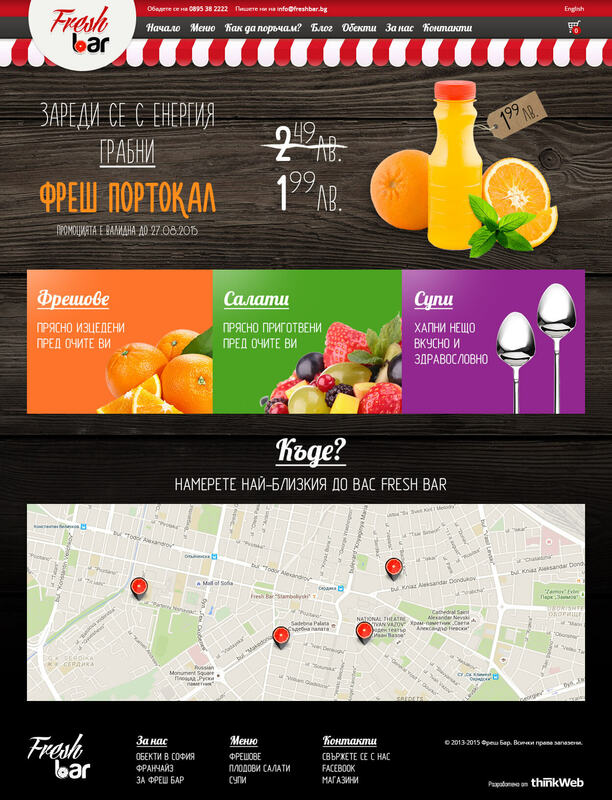 Founded in 2013, Fresh Bar is the fastest growing juice bar franchise in Bulgaria. We were tasked to build the website of the company and an online store where users can customize and order their favorite drinks and salads. We implemented dynamic pricing logic that was not limited to the predefined products and combinations and enabled users on the site to mix and match ingredients, creating their own custom juices and salads. Since the bars operate locally, we developed an easy to use interface for defining delivery zones around each bar. User addresses are geocoded and matched against them to see if delivery is possibile and which store should fulfill the order. A configurable order routing procedure enables overriding the default store in peak hours and holidays. Using just a few ingredients, users can create more than 1300 combinations of their own juices and fruit salads and have them delivered at their doorstep.